In most projects, being the sole surgeon is always stressful, physically and mentally demanding. You need to carry out all kinds of intervention to save the lives or limbs of our patients. There are always some rewarding moments; however, you also need to face the reality that there are times when you fail the patients and feel demoralized! The pattern of disease in here are so different from that in those in modern cities, here exists a lot of infections, traumas and accidents like burns, not to mention gunshot wounds or chop wounds that we seldom need to handle in our city. Moreover, you need to cross the line and do a lot of caesarean sections and even some gynecological interventions that you are not supposed to do back home. Therefore, you need to have a wide range of surgical skills and knowledge to be successful in treating our patients. In difficult situations like these, we are always told to accept our limits and understand that there are always moments when the skills required for intervention is just beyond our abilities. Even so, I don’t feel more at ease. I cannot accept failing the patients without feeling bad! So keep learning and improving becomes part of my life in MSF. Similar to the previous seven missions, I still have bad experiences this time. A lady came to our hospital in septic shock 6 days after caesarean section which I did not find any major problem during the exploration except dirty fluids inside the abdomen. What was worse, the lady died at that night. Moreover, there was a lady who had a cut at the back of her knee by a machine with all the main artery, veins and nerves broken. I tried my best to reconnect the artery but still I failed after multiple attempts. Of course we lacked the proper instruments and suture materials for artery reconnection, but a fail was still a fail, and that cost her leg amputated. These moments are always disheartening! No matter what excuses I have, I still feel bad because I failed the patient. A life is a life; a limb is a limb! Despite all these grumbles, there are some happy and satisfying moments in the field! For example, today is a very special day for some of our patients and myself. There was a man in his 30s who came to our hospital in Lulimba with a very bad infection around his right groin and scrotal region. My previous surgeon succeeded in cutting away all infected tissues and even did a colostomy to divert the stool away from the wound. Everyone was surprised that he survived. But how could we treat the wide open wound with both testes exposed? After understanding his condition, I decided to do constructive surgery to cover the wound and at the end we succeeded in using the muscle with the overlying skin from his inner thigh to cover the whole wound. And last week we just closed the colostomy as well. So today we removed all the sutures and he could finally go home after staying in the hospital for more than 2 months! Everyone in the surgical team was so happy for him as no one could expect that he can return home with the wound fully recovered and healed! 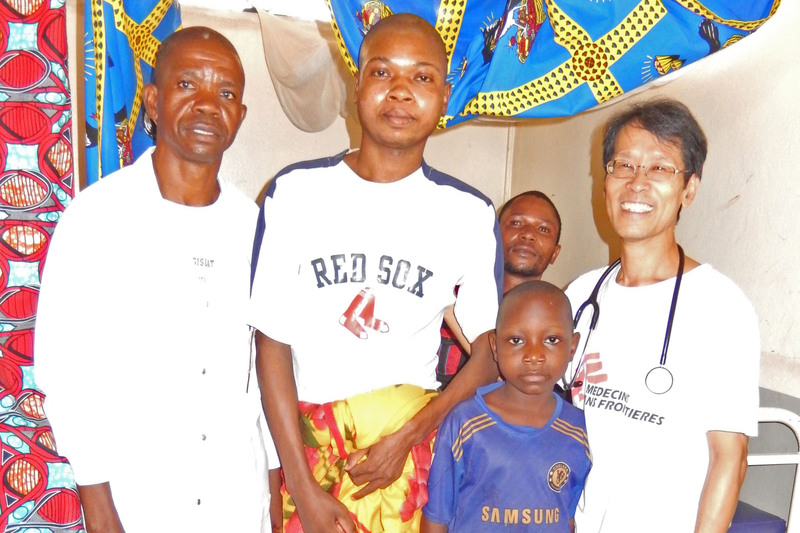 On the same day, we discharged two more boys with medical problems for a long time too! The first one had stayed in our hospital since late January with constant discharge of pus from his right leg. After I saw him in early April, we knew that he was suffering from chronic bone infection and we needed to take out that piece of dead bone inside his leg to clean up the infection. At last, we successfully removed the dead bone and there was no more infection . Two weeks ago we did skin graft to cover his wound then 2 days ago we fitted him with a protective cast from plaster of Paris. Today he was going home after in our hospital for over 3 months! There was another boy with severe burn. He survived but left some bad scars contracture in his right elbow, left wrist and anterior hip region. Many procedures were done for him in the past but the result was still unsatisfactory. We suggested to carry out scar revision for him which his parents also agreed after discussion. We used 3 different kinds of techniques for various regions and we did our final dressing for him today. All 3 areas of his body recovered nicely with much improved mobility! Therefore he was also going home today. What a great moment to celebrate and to be remembered! So these are the ups and downs of a MSF surgeon. Bad moments keep you humble, motivate you to improve and stretch your limit; and the good moments motivate you to continue contributing for MSF in the future!